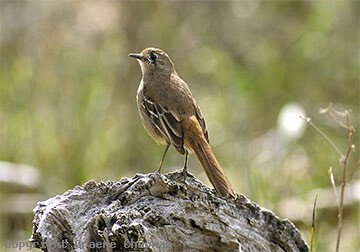 Scrub-robins are long-legged, ground-frequenting birds that belong to the passerine family from Australia and New guinea Petroicidae, known as Australian Robins. Southern Scrub-robins have a patchy distribution across southern Australia from central NSW right across to Shark Bay in W.A. Principally inhabitants of mallee they also occur in other dense shrublands of the interior where the suitable structure of a closed canopy that is bare at ground level suits their daily ritual of running around on the ground feeding in the litter. Even their nest is placed on the ground, or rather in the ground. 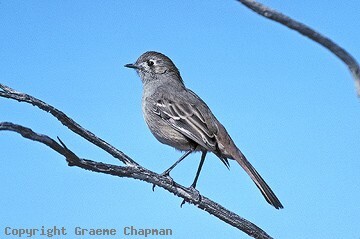 They rarely ascend into the shrubbery - sometimes the males do sing from a perch a couple of metres up. Amongst their principal habitats, dense thickets of Melaleuca uncinata are a favourite. Unfortunately these days, these thickets (known as ti-tree or broombush) are regularly harvested to supply what is known as brush fencing, popular in some suburban areas. Combined with the widespread clearing of the mallee lands for agriculture, their future is constantly under threat. Fortunately much of the remaining mallee is now preserved in reserves and national parks and the birds are not difficult to find there. 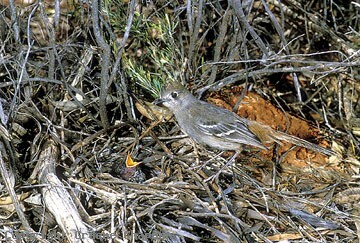 441203 ... Southern Scrub-robin at nest with nestling. 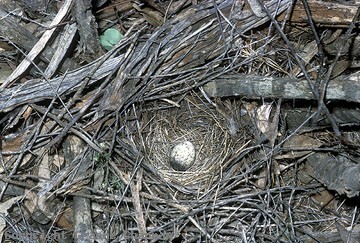 441204 ... A single egg forms the clutch - rare in Australian passerines.